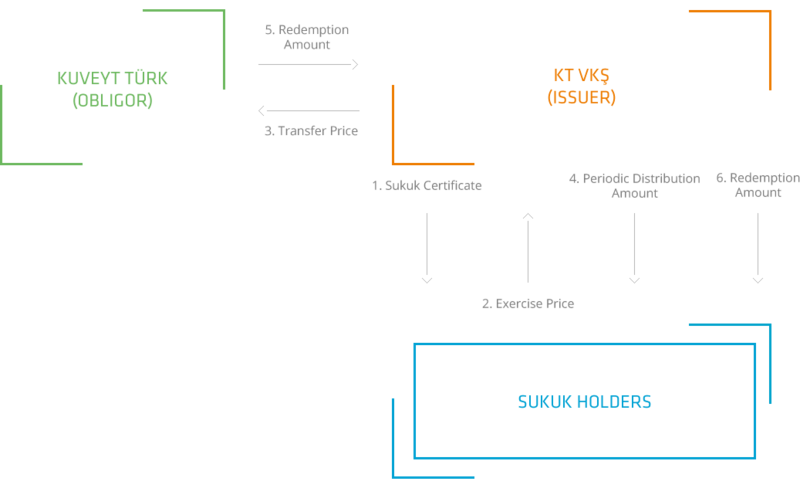 Sukuk (A Lease Certificate) is a security issued by an Asset Leasing Company in order to finance the assets that are acquired or leased on behalf and for the benefit of certificate holders. It entitles its holders to receive the revenues derived from such assets in proportion to their shares. Coupon payment: Sukuk entitles the holder of the leased assets to receive periodic fixed rental income. Asset Based: All issued certificates are based on a real commercial relationship and a visible and tangible property. Liquidity Opportunity: Sukuk is traded in Borsa Istanbul in which secondary market transactions are available for liquidity purposes. The investors may convert their certificates totally or partly to cash prior to maturity date. Term: There are many options including mostly 3 months, 6 months and 1 year. Tax Advantage: Withholding tax is charged at a rate of 10% for sukuk denominated in TL for individual investors. Withholding tax is 0% for corporate investors.